Born: 24 May 1835, Brundish, Suffolk, United Kingdom. Died: 24 May 1900, Pietermaritzburg, South Africa. Edward ('Gold') Button was the son of James Clark Button and his wife Matilda Thurston and a brother of Frederick ('Diamond') Button*. The family came to Natal from England in December 1854, but James died shortly after his arrival with the result that the family broke up. Edward earned his nickname following his discovery of gold in the South African Republic (Transvaal). From 1860 to 1864 he received some geological training while working for the geologist and Surveyor-General of Natal, P.C. Sutherland*. 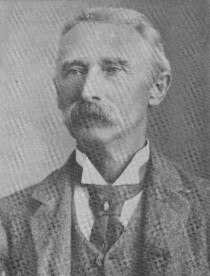 In 1867 and 1868 he served on the committees of both the Durban Horticultural Society and the Natal Agricultural and Horticultural Society. He was also a keen and early member of the Natural History Association of Natal (founded in 1868), with an interest in botany. Plants that he collected at this time, especially terrestrial orchids and seeds, were sent to Kew Gardens by M.J. McKen*, who named the genus Buttonia after him. In about 1869 Button went prospecting for gold with three other Natalians, George Parsons, James Sutherland, and Tom McLachlan, following the announcement by Karl Mauch* that he had discovered gold in the Lydenburg district. Button traversed the country north of Lydenburg to the Limpopo River, searching for both gold and plants. In 1870 he prospected, among other places, in a range of hills which he named the Sutherland Range, after James, near the Klein Letaba, and in the Murchison Range, which he named after the British geologist Sir Roderick Murchison who prospected with him there. He is credited with the discovery of various traces and deposits of gold and other minerals, the most important being the well-known Eersteling gold deposit near Marabastad, in the geological succession now known as the Pietersburg Greenstone Belt. This discovery was announced in September 1871 and in that same year Button was appointed as gold commissioner of the South African Republic. However, he resigned from this position in March 1872 and floated the Transvaal Gold Mining Company, the first of its kind in the republic. The company mined at Eersteling from 1871. Button was its manager until 1875, when he settled near Lydenburg. He also served as justice of the peace at Eersteling. In 1872 he wrote a paper on "Explorations in the gold regions of the Limpopo", which was summarized in the Report of the British Association for the Advancement of Science for that year. In later years Button was connected with East Rand Gold Mines in Johannesburg. He served on the first council of the Geological Society of South Africa in 1895-6, but was no longer a member of the society by 1899. He has been described as a jovial person with a kindly disposition, always willing to help or advise young prospectors. Geni, at http://www.geni.com/people/Edward-Button/6000000030617973334 Retrieved 2016-1-27. Geological Society of South Africa. Transactions, 1895-1899, Vol. 1-4: lists of office bearers and members. Natal almanac and yearly register for 1867-1869: Durban Horticultural Society; Natal Agricultural and Horticultural Society. National Automated Archival Information Retrieval System (NAAIRS). http://www.national.archives.gov.za/naairs.htm Documents relating to Edward Button / E. Button. Ward, J.H.W. & Wilson, M.G.C. Gold outside the Witwatersrand Basin. In M.G.C. Wilson & C.R. Annhaeusser (eds), The mineral resources of South Africa (6th ed., pp. 350-386). Pretoria: Council for Geoscience, 1998.